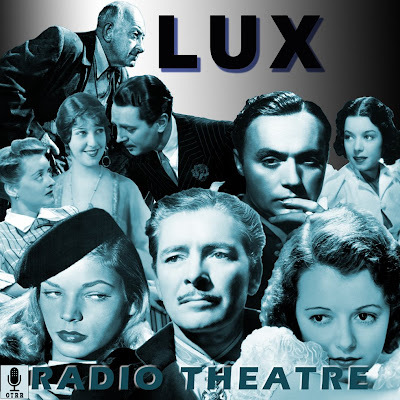 Lux Radio Theater, a long-run classic radio anthology series (NBC Blue Network (1934-1935); CBS (1935-1954); NBC (1954-1955)) which first adapted Broadway stage works, and then films to hour-long live radio presentations. It became the most popular dramatic anthology series on radio, broadcast for more than 20 years, and continued on television as the Lux Video Theatre through most of the 1950s. Cecil B. DeMille was the host of the series each Monday evening from June 1, 1936, until January 22, 1945. On several occasions, usually when he was out of town, he was temporarily replaced by various celebrities, including Leslie Howard and Edward Arnold . Lux Radio Theater strove to feature as many of the original stars of the original stage and film productions as possible, usually paying them $5,000 an appearance. In 1936, when sponsor Lever Brothers (who made Lux soap and detergent) moved the show from New York City to Hollywood, the program began to emphasize adaptations of films rather than plays. The first Lux film adaptation was The Legionnaire and the Lady, with Marlene Dietrich and Clark Gable, based on the film Morocco. That was followed by a Lux adaptation of The Thin Man, featuring the movie's stars, Myrna Loy and William Powell. Many of leading names in stage and film appeared in the series, most in the roles they made famous on the screen, including Abbott and Costello, Jean Arthur, Lauren Bacall, Lucille Ball, Ethel Barrymore, John Barrymore, Lionel Barrymore, Ingrid Bergman, Humphrey Bogart, Charles Boyer, James Cagney, Claudette Colbert, Ronald Colman, Gary Cooper, Joseph Cotten, Joan Crawford, Bing Crosby, Bette Davis, Dan Duryea, Frances Farmer, Errol Flynn, Ava Gardner, Judy Garland,Greer Garson, Cary Grant, Lillian Gish, Charlton Heston, Bob Hope, Vivien Leigh, Fredric March,Agnes Moorehead, Paul Muni, Vincent Price, Donna Reed, Ginger Rogers, Mickey Rooney, Frank Sinatra, Ann Sothern, Barbara Stanwyck, James Stewart, Shirley Temple, Gene Tierney, Spencer Tracy, Lana Turner, John Wayne, Jane Wyman, Orson Welles, Loretta Young and Robert Young. Though the show focused on film and its performers, perhaps inevitably several classic radio regulars appeared in Lux Radio Theater productions. Jim and Marian Jordan, better known as Fibber McGee and Molly, appeared on the show twice and also built an episode of their own radio comedy series around one of those appearances. Their longtime costar, Arthur Q. Bryan (wisecracking Doc Gamble) made a few Lux appearances as well. Bandleader Phil Harris, a longtime regular on Jack Benny's radio program, and his wife Alice Faye, who became radio stars with their own comedy show in 1948, appeared in a Lux presentation. Fred Allen, Jack Benny (with and without his wife, Mary Livingstone), George Burns and Gracie Allen were among the other radio stars who were invited to do Lux presentations as well. At least once Lux Radio Theater presented an adaptation of the film version of a radio series, The Life of Riley, featuring William Bendix as the Brooklyn-born, California-transplanted, stumbling but bighearted aircraft worker he already made famous in the long-running radio series (and eventual television hit) of the same name. But also at least once Lux Radio Theater offered a presentation without any known performers---its adaptation of This Is the Army during World War II featured a cast of American soldiers. Mercury Theatre on the Air — which eventually made Orson Welles a force to be reckoned with, especially with his broadcast of The War of the Worlds (30 October 1938) provoked — was initially a summer replacement series for Lux Radio Theater in 1938. A famous urban legend claimed that actor Sonny Tufts was slated to appear as a guest alongside Joan Fontaine for a production of The Major and the Minor on Lux Radio Theater. When Joseph Cotton read the names of the next week's cast, he supposedly said, with a mixture of shock and astonishment, that listeners would hear "that new, talented personality... Sonny Tufts?!" However, this never happened. The legend began as a fake segment on one of Kermit Shafer's popular "Bloopers" albums, which have been criticized for their "re-creations", fabrications and lack of accuracy. In actuality, Tufts was introduced by Cotton on the radio series Suspense, but Cotton's introduction was perfectly normal. A clash over closed shop union rulings favored by the American Federation of Radio Artists ended DeMille's term as host of Lux Radio Theater. AFRA assessed members a dollar each to help back a campaign to enact closed-shop rulings in California. DeMille, an AFRA member but a stern opponent of closed shops, refused to pay because he believed it would nullify his opposition vote. When AFRA ruled those not paying faced suspension from the union, and thus a ban from appearing on the air, DeMille was finished in radio---because he also refused to let anyone else pay the dollar for him. Lux Radio Theater employed several hosts over the following year, eventually choosing William Keighley as the new permanent host, a post he held from late 1945 through 1952. After that, producer-director Irving Cummings hosted the program until it ended in 1955. 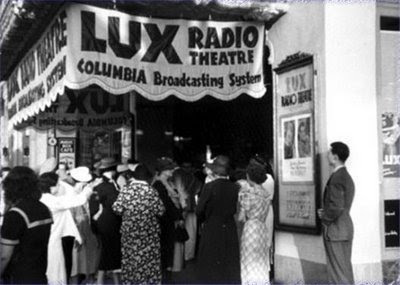 During its years on CBS in Hollywood, Lux Radio Theater was broadcast from the Lux Radio Playhouse located at 1615 North Vine Street in Hollywood, one block south of the famed intersection of Hollywood and Vine. The theater was later renamed The Huntington Hartford Theater, The Doolittle Theater and is now the Ricardo Montalban Theater. Wow! There's no other word for it; this collection is fantastic! Thank you. About six or seven months ago I got rid of all television access without the least regret. It's much better to use the imagination guided by good audio plays. Love it. WOW! What a Fantastic collection!!! LOVE these OTR shows! Do you happen to have "The African Queen"? Holy cow!! Thank you immensely! 36-08-10 The Jazz Singer was from 47-06-02. They reference The Jolson Story which came out in 1946. At 56:12 says the next week's show is "Warner Brother's recent hit One More Tomorrow". That movie was released in 1946. 38-06-27 Jane Eyre was 440605. Next week's show announced as Naughty Marietta. "A Man's Castle" (starring Spencer Tracy and Loretta Young) has the real Father Flanagan from Boys' Town as the special guest, talking during the intermission. How cool to hear what he had to say and how he sounded! He said he lies awake many nights, wishing he could live up to Spencer Tracy's portrayal of him in the movie. It's worth listening to. Very touching.